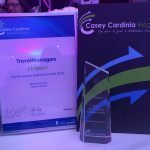 Edgar, who is TravelManagers’ representative for Narre Warren South, says she was delighted with the outcome of the Casey Cardinia Business Awards, which are run by the City of Casey and the Cardinia Shire Council. TravelManagers’ Executive General Manager, Michael Gazal, says the company is extremely proud of Edgar’s accomplishment, hailing it as recognition of the hard work that she has put into building her business over the past 10 years. 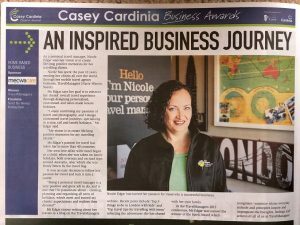 PTM Nicole Edgar was delighted to pick up the award for “Home Based Business of the Year” at the Casey Cardinia Business Awards. The awards, which are offered annually, aim to celebrate the outstanding achievements of local businesses in the Casey Cardinia area. After the initial application process, the three finalists in each category were visited in their place of work to be interviewed by an independent judging panel, with the winners eventually announced at a gala awards dinner, hosted by Channel 9 Melbourne weather girl & ‘Getaway’ reporter, Livinia Nixon. As well as collecting a $1000 cash prize and an attractive crystal trophy which is now proudly on display in her home office, Edgar has received considerable exposure within her local community since the win, which she is already converting into new business. 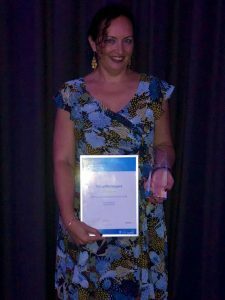 Her recent success in the local Business Awards have already resulted in excellent publicity for TravelManagers’ Nicole Edgar. “It’s early days yet, but I had several people approach me at the gala awards evening who are interested in booking their next holidays with me,” she says. As well as the boost to her brand profile thanks to the publicity surrounding the awards, Edgar also received practical support for her businesses, in the form of a toolkit that included assistance in writing a media release, practical steps for publicise her success and tips for using social media to promote her business. 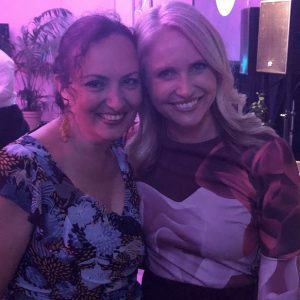 PTM Nicole Edgar learned of her win at a gala dinner, hosted by Channel 9 Melbourne weather girl and ‘Getaway’ reporter, Livinia Nixon. You’d be forgiven for assuming that, having been a finalist every year she’s entered and having already won in two categories, that Edgar is now finished with the Casey Cardinia Business Awards.